ATCHISON — When it comes to Rich and Cindy Dickason, having hearts of stone is actually a good thing. Drive onto the campus of Benedictine College, Maur Hill-Mount Academy or St. Benedict School in Atchison and you will see rock hard evidence of this couple’s generosity. The Dickasons have been significant financial supporters in the Atchison community for more than 45 years and credit their parents for showing them the importance of giving back. “I think you learn the importance of giving something away if you’re fortunate enough to have it,” Rich said. In recent years, the Dickasons’ generosity has become tangible in the form of religious symbols. The first of these came as a result of a request by Father Gerard Senecal, OSB, then pastor of St. Benedict’s Parish. 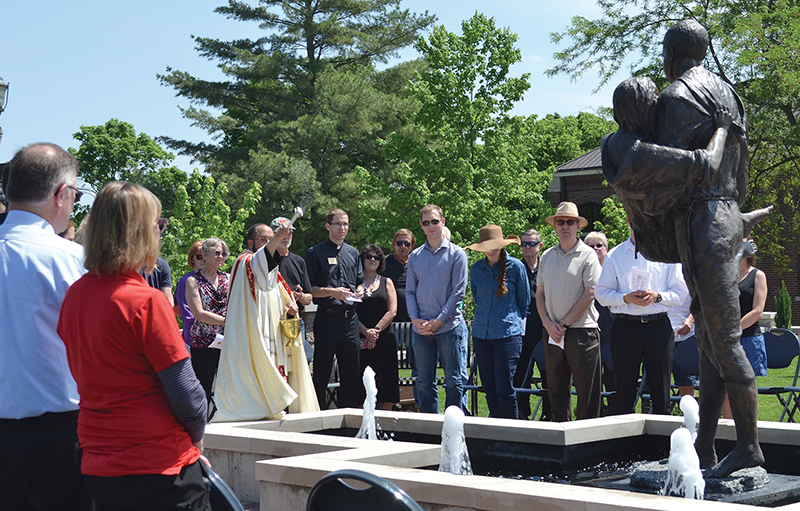 The Dickasons donated a statue of St. Benedict for the school, which they did in honor of their whole family. And Benedictine College boasts two St. Michael the Archangel icons, as well as one of St. Maria Faustina Kowalska, thanks to the Dickasons. So, when it came time for Benedictine College to add a statue of the Sacred Heart of Jesus to its new memorial park, the college knew right where to turn. This big project was more of a financial undertaking than past donations, giving the Dickasons pause to reflect on their decision. However, it soon became quite apparent that this was a venture they wanted to be a part of. The most recent of their contributions can be found standing tall in the middle of a cross-shaped fountain in the center of Maur Hill-Mount Academy’s newly renovated front entrance quad. The statue depicts one of the school’s patron saints, St. Maur, rescuing a young St. Placidus from drowning. Maur Hill – Mount Academy president Phil Baniewicz approached the Dickasons with the idea of commissioning the piece for the school’s exterior front entrance. The Dickasons said it didn’t take Baniewicz long to convince them that it was an important addition. But what most people will not realize is that the statue bears a resemblance to someone particularly important to the Dickasons — their late son, Dr. Richard R. Dickason Jr., a 1987 alum of Maur Hill Prep School. His parents’ gift is now a memorial to that love. “We love what’s happening at Maur Hill – Mount Academy and love the impact this new front entrance is making,” said Rich. The idea was that of the statue’s sculptor, Aleda Haug, who is a family friend and knew Rich Jr. personally. Haug’s decision to use Rich Jr.’s likeness for the statue grew out of several considerations. First, Haug sought to honor his parents’ generous contribution to the project. But Rich Jr.’s profession as a pediatric reconstructive surgeon — with his life mission being to help kids — was another factor. The third, and perhaps most poignant, was how it served as a special reminder to the students of Maur Hill-Mount Academy. “Older students, look out for the underclassmen and carry them down the right path. Underclassmen, cling to the upperclassmen and look to them to guide you to safety,” Haug said at the statue’s unveiling. “It’s about helping a friend, but it’s also about saving a life, which is what Rich Jr. did,” Rich said. Though they have given in many different ways over the years, gifts of statues have now become the Dickasons’ calling card. “The statues are permanent,” Rich said. “There’s always new people coming in [to the schools], so the statues will never get old.